If someone wished to find a description about Milan the most suitable phrase would be a striking city. Modern and ancient architecture blend together creating a unique mosaic of diversities. Milan’s style is certainly captivating to say the least and even though it is the leader of the country’s economy and home of the stock exchange it manages to attract thousands of tourists and especially fashion addicts who want to pay a tribute to the world’s largest designers who are found in Milan’s famous runways. 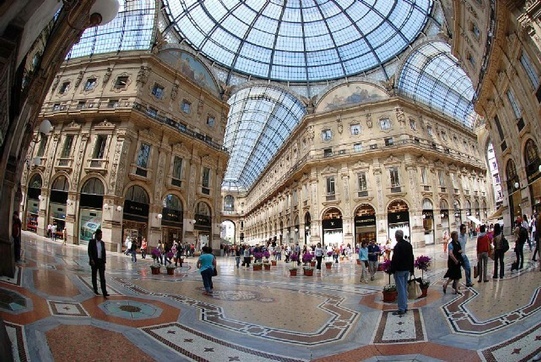 Milan is also the core of home ware designers and the centre of many art galleries. As you can see Milan’s glamour is apparent everywhere and you as a visitor cannot be an exception You may wonder which is the best way to really get to know Millan a piece of advice don’t waste any time thinking, open your pc visit our website at www.vanrental24.com and experience the unique feeling of travelling with all the amenities. Yes you have just become a privileged Van hire traveller. 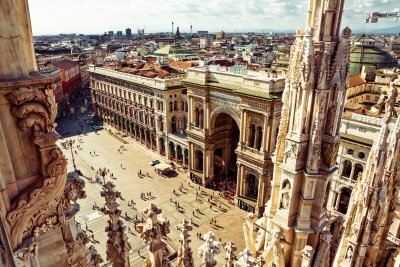 Milan is all most synonymous with the Duomo so there is not doubt that your first stop with your minivan rentals must be here. This amazing cathedral with the pink marble and the white façade decorated with more than 135 spires and 3200 statues creates a spectacular and insurmountable attraction. Its unique shape like a crown leaves the visitor dazzled. The interior is of equal magnitude with the multi-coloured glass windows and the crypt. The scent of Art and the glory of Leonardo da Vinci will lead you step to the Basilica di Santa Maria delle Grazie where you will have the chance to see Leonardo Da Vinci’s most famous mural Il Cenacolo (the last supper )which portrays Christ and his disciplines when he revealead that he is aware of the betray that is bound to happen. The museo del Novecento definitely demands a visit located in the Duomo Plaza and offering an amazing view of the Cathedral. It was the place from where Mussolini addressed his speeches to the crows in the days of his peak. Now the place has been converted into a museum that houses Milan’s 20th century exhibits with the likes of Umberto Boccioni, Campigli, de Chirico and Marinetti, more than distracts. The museum of Poldi Pezzoli is really intriguing for the visitor to see. Pezzoli inherited his mother’s great fortune and her love for art so he had the idea to collect all of his treasures and transform his house into a museum with separated hall featuring different themes of the great art periods of the past(Middle Ages , Early Renaissance, Baroque, and Rococo). After all this sightseeing you definitely need a rest, so relax and enjoy wonderful spaghetti or a pizza meal. The exquisite Italian tastes will tickle your palette; of course for a good finish a cappuccino is indispensable. Being the heart of Italy’s economy Milan attracts thousands of demanding businessmen who want everything to work like a good- turned watch. Their daily program in Milan revolves around meeting and much moving around. For these people Van rentals is the modern way of travelling and redefines everything about on road movements. A 9 seat minivan is spacious, adjustable and helps you move around without the need of leaving anything behind It is your on road partner which recruits all of its abilities so as to offer you the ultimate comfortable journey. And you want to know what the best part is that is both efficient and affordable. A vehicle that helps you make the best of your business trip and explore the city as well.